Penicillium is any of various bluish-green fungi of the genus Penicillium, that grow as molds on decaying fruits, ripening cheeses, and bread, and are used to produce penicillin and certain other antibiotics. Different species of these fungi produce many types of secondary metabolites, ranging from the antibacterial drug penicillin to the antifungal drug griseofulvin, along with many compounds that are toxic to humans and animals. Several species are plant pathogens and cause fruit to rot, and one type causes a human disease in areas of Asia. Other species of these fungi have commercial uses, such as being used to produce several different types of cheese or various types of industrial chemicals. It is frequently the first type of mold to colonize water damaged houses and can cause serious illnesses in the inhabitants. Penicillin was discovered accidentally by Alexander Fleming as Penicillium mold contaminating a culture plate of bacteria. Fleming noticed that there was a clear zone around the fungi where the bacteria had died. He pursued this observation and isolated penicillin from Penicillium notatum. The genus was first described in the scientific literature by Johann Heinrich Friedrich Link in his 1809 work Observationes in ordines plantarum naturales, writing “Penicillium. Thallus e floccis caespitosis septatis simplicibus aut ramosis fertilibus erectis apice penicillatis”. The genus name is derived from the Latin root penicillum, meaning “painter’s brush”, and refers to the chains of conidia that resemble a broom. The vegetative body is mycelial. The mycelium is profusely branched with septate hyphae, composed of thin-walled cells containing one to many nuclei. Each septum has a central pore, through which cyto­plasmic continuity is maintained. Some mycelia grow deeper into the substratum to absorb food material and others remain on the substrate and grow a mycelial felt. The reserve food is present in the form of oil globules. Penicillium chrysogenum was discovered on a cantaloupe and was found to produce a much higher level of the drug. Mutant fungi that produced even larger quantities of penicillin were created by treating the fungi with radiation. Some species of Penicillium reproduce sexually by means of asci and ascospores produced within small stony stromata. These teleomorphs were the basis for the separate genus Eupenicillium, now no longer in use. See the discussion of the Eurotiales for an illustration of one of these. Species of the genus Talaromyces produce anamorphs very similar to those of Penicillium species. 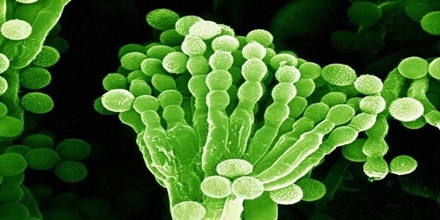 Penicillium species are present in the air and dust of indoor environments, such as homes and public buildings. The fungus can be readily transported from the outdoors, and grow indoors using building material or accumulated soil to obtain nutrients for growth. Penicillium growth can still occur indoors even if the relative humidity is low, as long as there is sufficient moisture available on a given surface. 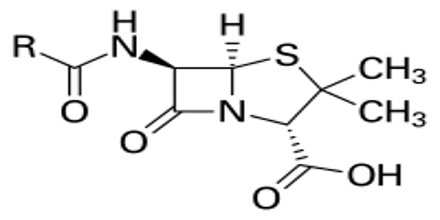 The most famous is penicillin, the first antibacterial drug to be discovered. 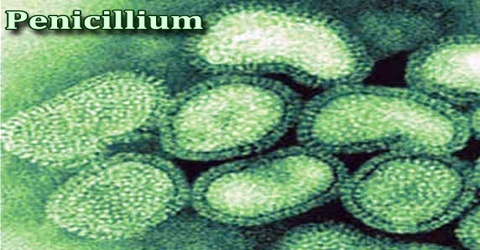 The drug penicillin is produced by Penicillium chrysogenum, a commonly occurring mould in most homes. Many members of the Penicillium genus are used to produce industrial chemicals such as tartaric, citric and gluconic acids, along with a variety of enzymes. They are used in the food industry to produce cheeses such as Roquefort and Camembert. Also, Penicillium fungi can be an ingredient in sausages and ham to help prevent other organisms from colonizing the meat. Some species produce toxins and may render food inedible or even dangerous. It is a good practice to discard foods showing the development of any mould. On the other hand some species of Penicillium are beneficial to humans. Cheeses such as Roquefort, Brie, Camembert, Stilton, etc. 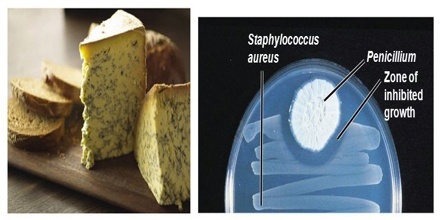 are ripened with species of Penicillium and are quite safe to eat. Penicillium chrysogenum is of major medical and historical importance as the original and present-day industrial source of the antibiotic penicillin. The species was considered asexual for more than 100 years despite concerted efforts to induce sexual reproduction. Reference: website.nbm-mnb.ca, wisegeek.org, biologydiscussion.com, wikipedia.